It's safe to say that the bathroom is a space where upgrading will almost always give you a return on investment. And when it comes to renovating this room in your home, it's important to take the appropriate steps. To get the biggest bang for your buck, Good Millwork suggests redoing out-of-date spaces with contemporary accoutrements to attract a wider range of potential buyers. Making over your room with a specific theme in mind can impact the number of people who may want to buy your home. Of course, there are some who choose fixer-uppers and might not mind the wall-to-wall floral wallpapers, but most prefer a house that is move-in ready. 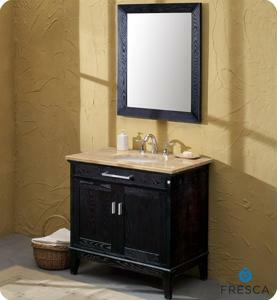 Because of this, you might want to choose a contemporary bathroom vanity that will anchor the space. Additionally, you may want to opt for the universally accepted white toilet and sink. Putting in nice finishes will also elevate the appeal of your bathroom and will show buyers its potential, according to the news outlet. Think about installing small details like tile boards, wainscoting or even sleek shelves to create a finished look.